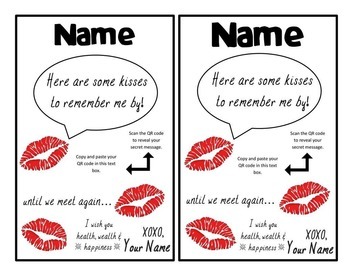 I found this super cute gift idea on Pinterest and decided to put my own little spin on it for my co-workers, but this could easily be modified for students too! I did this as an end of the year gift, but since this template is in Word, you can edit it however you like and make it fit the occasion. I used QRStuff.com to generate a personalized "plain text" QR code for each and every card. You can always generate a single standard message, but I it would encourage everyone to scan each other's gifts, if each card had a different message. Once you've printed out your cards, simple place a few Hershey's Kisses in a Ziploc or staple it to a small gift bag of the candies. If you want to know more about how I created these, CLICK HERE to visit my blog post.